If you take a ride on on the Amtrak Pacific Surfliner when Anthony Bryant is onboard, you'll hear him sing. 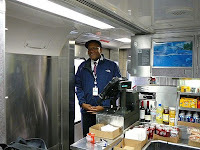 This railroad café car worker is not a trained singer, he tells AOL Travel News, but he is a train singer. We couldn't resist. 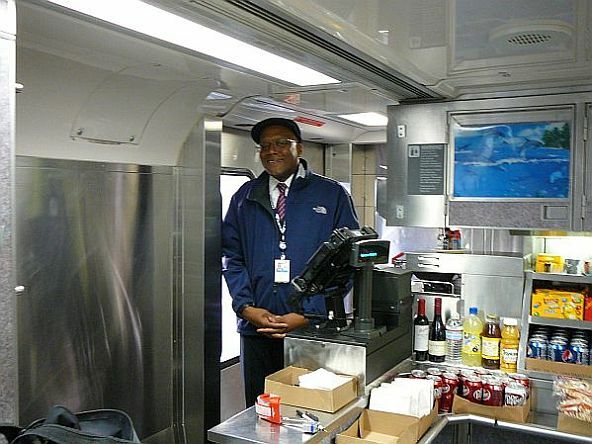 Bryant, 52, has been working for Amtrak for 18 years. But it's only in the past few years, on the scenic Southern California coastal route, that he's felt the urge to break into song. He comes on the PA system as the train pulls away from the station – the Pacific Surfliner serves the coast from San Diego to Los Angeles up to San Luis Obispo – and sings to passengers both a greeting and the café car menu. "The reason I started to sing is primarily when it's not too busy in the café car, and people are sitting up and enjoying the fine scenery of the ocean, they need a little push to come downstairs and purchase something," Bryant says. But he says he also sings to make people happy.